variability and anthropogenic forcing, concluding that a substantial proportion of the recent variability is circulation-driven, and that the Arctic is in the early stages of a manifestation of a human-induced greenhouse signature. This conclusion is based largely on the relatively slow rate of emergence of the greenhouse signal in model simulations of the late 20th and early 21st centuries. 2005). The latter regions, together with the Antarctic Peninsula, have been the most rapidly warming areas of the globe over the past several decades (Turner et al., 2007). The North Atlantic sub-polar seas show little warming during the same time period, probably because of their intimate connection with the cold, deep waters. Temperatures in the upper troposphere and stratosphere of the Arctic have cooled in recent decades, consistent with increases in greenhouse gases and with decreases in stratospheric ozone since 1979 (Weatherhead et al., 2005). Precipitation in the Arctic shows signs of an increase over the past century, although the trends are small (about 1% per decade), highly variable in space, and highly uncertain because of deficiencies in the precipitation measurement network (McBean et al., 2005) and the difficulty in obtaining accurate measurements of rain and snow in windy polar regions. There is no evidence of systematic increases in intense storms in the Arctic (Atkinson, 2005) although coastal vulnerability to storms is increasing with the retreat of sea ice (see Section 15.4.6). Little is known about areally averaged precipitation over Greenland. The discharge of Eurasian rivers draining into the Arctic Ocean shows an increase since the 1930s (Peterson et al., 2002), generally consistent with changes in temperature and the large-scale atmospheric circulation. Reductions of Arctic sea ice and glaciers (see Lemke et al., 2007), reductions in the duration of river and lake ice in much of the sub-Arctic (Prowse et al., 2004; Walsh et al., 2005), and a recent (1980s to present) warming of permafrost in nearly all areas for which measurements are available (Romanovsky et al., 2002; Walsh et al., 2005) are consistent with the recent changes in Arctic surface air temperatures. Although there is visual evidence of permafrost degradation (Lemke et al., 2007), long-term measurements showing widespread thickening of the active layer are lacking. Changes in vegetation, particularly a transition from grasses to shrubs, has been reported in the North American Arctic (Sturm et al., 2001) and elsewhere (Tape et al., 2006), and satellite imagery has indicated an increase in the Normalised Difference Vegetation Index (NDVI, a measure of photosynthetically active biomass) over much of the Arctic (Slayback et al., 2003). This is consistent with a longer growing season and with documented changes in the seasonal variation in atmospheric CO2 concentrations as reported in the TAR. Broader ecosystem impacts of climate change in both polar regions are summarised by Walther et al. (2002) and were documented more extensively for the Arctic by the Arctic Climate Impact Assessment (ACIA, 2005). 2006) indicate thinning around the periphery of the Greenland ice sheet, where summer melt has increased during the past 20 years (Abdalati and Steffen, 2001; Walsh et al., 2005), while there is evidence of slower rates of thickening further inland (Johannessen et al., 2005). The Arctic is now home to approximately 4 million residents (Bogoyavlenskiy and Siggner, 2004). Migration into the Arctic during the 20th century has resulted in a change of demographics such that indigenous peoples now represent 10% of the entire population. This influx has brought various forms of social, cultural and economic change (Huntington, 1992; Nuttall, 2000b). For most Arctic countries, only a small proportion of their total population lives in the Arctic, and settlement remains generally sparse (Bogoyavlenskiy and Siggner, 2004) and nomadic peoples are still significant in some countries. On average, however, two-thirds of the Arctic population live in settlements with more than 5,000 inhabitants. Indigenous residents have, in most regions, been encouraged to become permanent residents in fixed locations, which has had a predominantly negative effect on subsistence activities and some aspects of community health. At the same time, Arctic residents have experienced an increase in access to treated water supplies, sewage disposal, health care facilities and services, and improved transportation infrastructure which has increased access to such things as outside market food items (Hild and Stordhal, 2004). In general, the Arctic has a young, rapidly growing population with higher birth rates than their national averages, and rising but lower than national average life-expectancy. This is particularly true for indigenous populations, although some exceptions exist, such as in the Russian north, where population and life-expectancy has decreased since 1990 (Einarsson et al., 2004). Political and administrative regimes in Arctic regions vary between countries. In particular, indigenous groups have different levels of self-determination and autonomy. Some regions (e.g., northern Canada and Greenland) now have formalised land-claim settlements, while in Eurasia indigenous claims have only recently begun to be addressed (Freeman, 2000). Wildlife management regimes and indigenous/non-indigenous roles in resource management also vary between regions. Nowadays, large-scale resource extraction initiatives and/or forms of social support play significant roles in the economies of many communities. Despite these changes, aspects of subsistence and pastoral livelihoods remain important. Regardless of its small and dispersed population, the Arctic has become increasingly important in global politics and economies. For example, the deleterious effect on the health of Arctic residents of contaminants produced in other parts of the world has led to international agreements such as the Stockholm Convention on Persistent Organic Pollutants (Downey and Fenge, 2003). Furthermore, significant oil, gas and mineral resources (e.g., diamonds) are still to be developed in circum-Arctic regions that will further increase the importance of this region in the world (e.g., U.S. Geological Survey World Energy Assessment Team, 2000; Laherre, 2001). although only two of these (one of each) are significant at the 10% level (Turner et al., 2005). If the individual station records are considered as independent measurements, then the mean trend is warming at a rate comparable to mean global warming (Vaughan et al., 2003), but there is no evidence of a continent-wide 'polar amplification' in Antarctica. In some areas where cooling has occurred, such as the area around Amundsen-Scott Station at the South Pole, there is no evidence of directly attributable impacts, but elsewhere cooling has caused clear local impacts. For example, in the Dry Valleys, a 6 to 9% reduction in primary production in lakes and a >10%/yr decline in soil invertebrates has been observed (Doran et al., 2002). Although the impacts are less certain, precipitation has also declined on sub-Antarctic islands (Bergstrom and Chown, 1999). 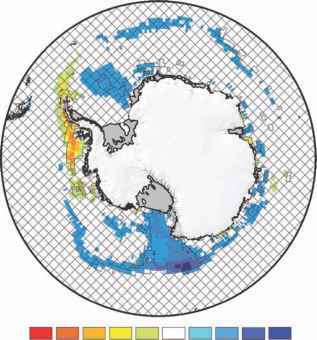 Recent changes in Antarctic sea-ice extent are discussed in detail elsewhere (Lemke et al., 2007), but evidence highlighted in the TAR (Anisimov et al., 2001) gleaned from records of whaling activities (de la Mare, 1997) is no longer considered reliable (Ackley et al., 2003). So, for the period before satellite observation, only direct local observations (e.g., Murphy et al., 1995) and proxies (e.g., Curran et al., 2003) are available. For the satellite period (1978 to present) there has been no ubiquitous trend in Antarctic sea-ice duration, but there have been strong regional trends (see Figure 15.2). Sea-ice duration in the Ross Sea has increased, while in the Bellingshausen and Amundsen Seas it has decreased, with high statistical significance in each case (Parkinson, 2002; Zwally et al., 2002). This pattern strongly reflects trends in atmospheric temperature at nearby climate stations (Vaughan et al., 2003). Increasing atmospheric CO2 concentrations are leading to an increased draw-down of CO2 by the oceans and, as a consequence, sea water is becoming more acidic (Royal Society, 2005). As is the case in other parts of the world's oceans, coccolithophorids and foraminifera are significant components of the pelagic microbial community of the Southern Ocean and contribute to the drawdown of atmospheric CO2 to the deep ocean. Experimental studies (Riebesell et al., 2000) indicate that elevated CO2 concentration reduces draw-down of CO2 compared with the production of organic matter. Recent investigations suggest that at the present rate of acidification of the Southern Ocean, pteropods (marine pelagic molluscs) will not be able to survive after 2100 and their loss will have significant consequences for the marine food web (Orr et al., 2005). Similarly, cold-water corals are threatened by increasing acidification. Furthermore, increasing acidification leads to changes in the chemistry of the oceans, altering the availability of nutrients and reducing the ability of the oceans to absorb CO2 from the atmosphere (Royal Society, 2005; see also Chapter 4 this volume). Vulnerability is the degree to which a system is susceptible to, or unable to cope with, adverse effects of stress; whereas adaptive capacity, or resilience, is an ability to adjust to stress, to realise opportunities or to cope with consequences (McCarthy et al., 2005). Many polar species are particularly vulnerable to climate change because they are specialised and have adapted to harsh conditions in ways that are likely to make them poor competitors with potential immigrants from environmentally more benign regions (e.g., Callaghan et al., 2005; Peck et al., 2006). Other species require specific conditions, for example winter snow cover or a particular timing of food availability (Mehlum, 1999; Peck et al., 2006). In addition, many species face multiple, concurrent human-induced stresses (including increased ultraviolet-B radiation, increasing contaminant loads, habitat loss and fragmentation) that will add to the impacts of climate change (Walther et al., 2002; McCarthy et al., 2005). Plants and animals in the polar regions are vulnerable to attacks from pests (Juday et al., 2005) and parasites (Albon et al., 2002; Kutz et al., 2002) that develop faster and are more prolific in warmer and moister conditions. Many terrestrial polar ecosystems are vulnerable because species richness is low in general, and redundancy within particular levels of food chains and some species groups is particularly low (Matveyeva and Chernov, 2000). Loss of a keystone species (e.g., lemmings, Turchin and Batzli, 2001) could have cascading effects on entire ecosystems. organisms that have great adaptive potential because of rapid turnover and universal dispersal. The adaptive capacity of current Arctic ecosystems is small because their extent is likely to be reduced substantially by compression between the general northwards expansion of forest, the current coastline and longer-term flooding of northern coastal wetlands as the sea level rises, and also as habitat is lost to land use (see Figure 15.3). General vulnerability to warming and lack of adaptive capacity of Arctic species and ecosystems are likely, as in the past, to lead to relocation rather than rapid adaptation to new climates (see Figure 15.3). As air and sea water temperatures have increased in the Bering Sea, there have been associated changes in sea-ice cover, water-column properties and processes including primary production and sedimentation, and coupling with the bottom layer (Grebmeier et al., 2006). A change from Arctic to subArctic conditions is happening with a northward movement of the pelagic-dominated marine ecosystem that was previously confined to the south-eastern Bering Sea. Thus communities that consist of organisms such as bottom-feeding birds and marine mammals are being replaced by communities dominated by pelagic fish. Changes in sea ice conditions have also affected subsistence and commercial harvests (Grebmeier et al., 2006). Many Arctic and sub-Arctic seas (e.g., parts of the Bering and Barents Seas) are among the most productive in the world (Sakshaug, 2003), and yield about 7 Mt of fish per year, provide about US$15 billion in earnings (Vilhjalmsson et al., 2005), and employ 0.6 to 1 million people (Agnarsson and Arnason, 2003). In addition, Arctic marine ecosystems are important to indigenous peoples and rural communities following traditional and subsistence lifestyles (Vilhjalmsson et al., 2005). Figure 15.3. Present and projected vegetation and minimum sea-ice extent for Arctic and neighbouring regions. Vegetation maps based on floristic surveys (top) and projected vegetation for2090-2100, predicted by the LPJ Dynamic Vegetation Model driven by the HadCM2 climate model (bottom) modified from Kaplan et al. (2003) in Callaghan et al. (2005). The original vegetation classes have been condensed as follows: grassland = temperate grassland and xerophytic scrubland; temperate forest = cool mixed forest, cool-temperate evergreen needle-leaved and mixed forest, temperate evergreen needle-leaved forest, temperate deciduous broadleaved forest; boreal forest = cool evergreen needle-leaved forest, cold deciduous forest, cold evergreen needle-leaved forest; tundra = low- and high-shrub tundra, erect dwarf-shrub tundra, prostrate dwarf-shrub tundra; polar desert/semi-desert = cushion forb, lichen and moss tundra. Also shown are observed minimum sea-ice extent for September2002, and projected sea-ice minimum extent, together with potential new/improved sea routes (redrawn from Instanes et al., 2005; Walsh et al., 2005). on higher trophic levels. This will impact economically important species, primarily fish, and dependent predators such as marine mammals and sea birds (Edwards and Richardson, 2004). Substantial evidence indicates major regional changes in Antarctic terrestrial and marine ecosystems in areas that have experienced warming. Increasing abundance of shallow-water sponges and their predators, declining abundances of krill, Adelie and Emperor penguins, and Weddell seals have all been recorded (Ainley et al., 2005). Only two species of native flowering plant, the Antarctic pearlwort (Colobanthus quitensis) and the Antarctic hair grass (Deschampsia antarctica) currently occur in small and isolated ice-free habitats on the Antarctic continent. Their increased abundance and distribution was ascribed to the increasing summer temperatures (Fowbert and Smith, 1994). Elsewhere on continental Antarctica, climate change is also affecting the vegetation, which is largely composed of algae, lichens and mosses, and changes are expected in future, as temperature, and water and nutrient availability, change (Robinson et al., 2003). The marked reduction reported in the biomass of Antarctic krill (Euphausia superba) and an increase in the abundance of salps (principally Salpa thompsoni), a pelagic tunicate, may be related to regional changes in sea ice conditions (Atkinson et al., 2004). This change may also underlie the late-20th century changes in the demography of krill predators (marine mammals and sea birds) reported from the south-west Atlantic (Fraser and Hoffmann, 2003), and this connection indicates a potential vulnerability to climate change whose importance cannot yet be determined. Recent studies on sub-Antarctic islands have shown increases in the abundance of alien species and negative impacts on the local biota such as a decline in the number and size of Sphagnum moss beds (Whinam and Copson, 2006). On these islands, increasing human activities and increasing temperatures are combining to promote successful invasions of non-indigenous species (Bergstrom and Chown, 1999). Climate variability/change has historically had, and will continue to have, impacts on Arctic freshwater resources. Firstorder impacts (e.g., changes to the snow/ice/water budget) play a significant role in important global climate processes, through feedbacks (e.g., changes to radiative feedbacks, stability of the oceanic stratification and thermohaline circulation, and carbon/methane source-sink status). Cascading effects have important consequences for the vulnerability of freshwater systems, as measured by their ecological or human resource value. From an ecological perspective, the degree of vulnerability to many higher-order impacts (e.g., changes in aquatic geochemistry, habitat availability/quality, biodiversity) are related to gradual and/or abrupt threshold transitions such as those associated with water-phase changes (e.g., loss of freshwater ice cover) or coupled bio-chemical responses (e.g., precipitous declines in dissolved oxygen related to lake productivity) (Wrona et al., 2005). Historically, Arctic freshwater ecosystems have adapted to large variations in climate over long transitional periods (e.g., Ruhland and Smol, 2002; Ruhland et al., 2003), but in the next 100 years the combination of high-magnitude events and rapid rates of change will probably exceed the ability of the biota and their associated ecosystems to adapt (Wrona et al., 2006a). This will result in significant changes and both positive and negative impacts. It is projected, however, that overall the negative effects will very probably outweigh the positive, implying that freshwater systems are vulnerable to climate change (Wrona et al., 2005). 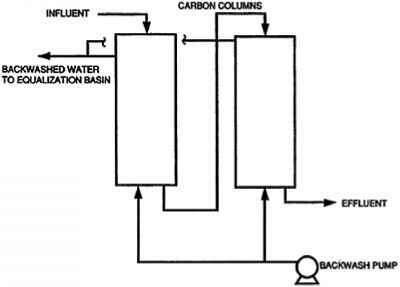 From a human-use perspective, potential adaptation measures are extremely diverse, ranging from measures to facilitate modified use of the resource (e.g., changes in ice-road construction practices, increased open-water transportation, flow regulation for hydroelectric production, harvesting strategies, and methods of drinking-water access), to adaptation strategies to deal with increased/decreased freshwater hazards (e.g., protective structures to reduce flood risks or increase floods for aquatic systems (Prowse and Beltaos, 2002); changes to more land-based travel to avoid increasingly hazardous ice). Difficulties in pursuing adaptation strategies may be greatest for those who place strong cultural and social importance on traditional uses of freshwater resources (McBean et al., 2005; Nuttall et al., 2005). Antarctic freshwater systems are fewer and smaller than those in the Arctic, but are no less vulnerable to climate change. The microbial communities inhabiting these systems are likely to be modified by changing nutrient regimes, contaminants and introductions of species better able to cope with the changing conditions. A drop in air temperature of 0.7°C per decade late in the 20th century in the Dry Valleys led to a 6 to 9% drop in primary production in the lakes of the area (Doran et al., 2002). In marked contrast, summer air temperature on the maritime sub-Antarctic Signy Island increased by 1°C over the last 50 years and, over the period 1980 to 1995, water temperature in the lakes rose several times faster than the air temperature; this is one of the fastest responses to regional climate change in the Southern Hemisphere yet documented (Quayle et al., 2002). As a consequence, the annual ice-free period has lengthened by up to 4 weeks. In addition, the area of perennial snow cover on Signy Island has decreased by about 45% since 1951, and the associated change in microbial and geochemical processes has led to increased amounts of organic and inorganic nutrients entering the lakes. There has also been an explosion in the population of fur seals (Arctocephalus gazella) on the island due to decreased ice cover and increased area available for resting and moulting. Together these changes are leading to disruption of the ecosystem due to increased concentrations of nutrients (eutrophication) (Quayle et al., 2003). Similar ecological vulnerabilities are expected to exist in other Antarctic freshwater systems. Permafrost, defined as sub-surface earth materials that remain at or below 0°C continuously for two or more years, is widespread in Arctic, sub-Arctic and high-mountain regions, and in the small areas of Antarctica without permanent ice cover. The physical processes of climate-permafrost interactions and observations of permafrost change are discussed elsewhere (Lemke et al., 2007); here we focus on the observed and projected changes of permafrost, and impacts they may have on natural and human systems in the Arctic. Observational data are limited, but precise measurements in boreholes indicate that permafrost temperatures in the Arctic rose markedly during the last 50 years (Romanovsky et al., 2002), with rapid warming in Alaska (Hinzman et al., 2005), Canada (Beilman et al., 2001), Europe (Harris et al., 2003) and Siberia (Pavlov and Moskalenko, 2002). Short-term and localised warming associated with the reduction of snow cover (Stieglitz et al., 2003) and feedbacks associated with increased vegetation productivity (Sturm et al., 2001; Anisimov and Belolutskaia, 2004; Chapin et al., 2005b) are, however, important considerations that must be taken into account. In the context of the future climate change, there are two key concerns associated with the thawing of permafrost: the detrimental impact on the infrastructure built upon it, and the feedback to the global climate system through potential emission of greenhouse gases. These are discussed in Sections 15.7.1 and 15.4.2.3. Neither Antarctica nor the sub-Antarctic islands have permanent human populations; the vast majority of residents are staff at scientific stations and summer-only visitors. While there are some areas of particular sensitivity (see Section 15.6.3), where climate change might dictate that facilities be abandoned, from a global perspective these can be viewed as logistical issues only for the organisations concerned. In contrast, the archaeological record shows that humans have lived in the Arctic for thousands of years (Pavlov et al., 2001). Previously, many Arctic peoples practised seasonal movements between settlements, and/or seasonally between activities (e.g., farming to fishing), and the semi-nomadic and nomadic following of game animals and herding. Today, most Arctic residents live in permanent communities, many of which exist in low-lying coastal areas. Despite the socio-economic changes taking place, many Arctic communities retain a strong relationship with the land and sea, with community economies that are a combination of subsistence and cash economies, in some cases, strongly associated with mineral, hydrocarbon and resource development (Duhaime, 2004). The vulnerable nature of Arctic communities, and particularly coastal indigenous communities, to climate change arises from their close relationship with the land, geographical location, reliance on the local environment for aspects of everyday life such as diet and economy, and the current state of social, cultural, economic and political change taking place in these regions. Jolly, 2001). However, for some Arctic peoples, movement into permanent communities, along with shifts in lifestyle and culture, limits some aspects of adaptive capacity as more sedentary lifestyles minimise mobility, and increased participation in wage-economy jobs decreases the number of individuals able to provide foods from the local environment. The sustainability of this trend is unknown. Small Arctic communities, however remote, are tightly tied politically, economically and socially to the national mainstream, as well as being linked to and affected by the global economy (Nuttall et al., 2005). Today, trade barriers, resource management regimes, political, legal and conservation interests, and globalisation all affect, constrain or reduce the abilities of Arctic communities to adapt to climate change (Nuttall et al., 2005). Trends in modernity within communities also affect adaptive capacity in both positive and negative ways. Increased access to outside markets and new technologies improve the ability to develop resources and a local economic base; however, increased time spent in wage-earning employment, while providing significant benefits at the individual and household levels through enhanced economic capacity, reduces time on the land observing and developing the knowledge that strengthens the ability to adapt. This underscores the reality that climate change is one of several interrelated problems affecting Arctic communities and livelihoods today (Chapin et al., 2005a). In some cases, indigenous peoples may consider adaptation strategies to be unacceptable, as they impact critical aspects of traditions and cultures. For example, the Inuit Circumpolar Conference has framed the issue of climate change in a submission to the United States Senate as an infringement on human rights because it restricts access to basic human needs as seen by the Inuit and will lead to the loss of culture and identity (Watt-Cloutier, 2004). Currently we do not know the limits of adaptive capacity among Arctic populations, or what the impacts of some adaptive measures will be. We expect climate change in the polar regions to have many direct regional impacts; however, those regional direct impacts may have global implications through the following processes and feedbacks. • Reflectivity of snow, ice and vegetation: snow, ice and vegetation play vital roles in the global climate system, through albedo and insulation effects. Since the TAR, increasing evidence has emerged indicating a more rapid disappearance of snow and sea-ice cover in some areas (e.g., Siberia, Alaska, the Greenland Sea), and consequent changes of albedo may be leading to further climate change (e.g., Holland and Bitz, 2003). • Retreat of glaciers and ice sheets, freshwater runoff, sea level and ocean circulation: the retreat of glaciers in the Arctic and more rapid melting of the edges of the Greenland ice sheet (Section 15.2.1), together with observed increases in river runoff (Peterson et al., 2002), the major contributor, will alter the freshwater budget of the Arctic Ocean. Further changes are expected and could influence ocean circulation with global impacts (Lemke et al., 2007). • Arctic terrestrial carbon flux: although models project that Arctic terrestrial ecosystems and the active layer will be a small sink for carbon in the next century, processes are complex and uncertainty is high. It is possible that increased emissions of carbon from thawing permafrost will lead to positive climate forcing (Sitch et al., 2007). Whether such emissions reach the atmosphere as methane or as carbon dioxide is important, because, on a per molecule basis, methane has more than 20 times the warming influence (Anisimov et al., 2005b). • Migrating species: species that seasonally migrate from lower latitudes to polar regions rely on the existence of specific polar habitats, and if those habitats are compromised the effects will be felt in communities and food webs far beyond the polar regions. These habitats are likely to be compromised by direct or consequential climate change impacts such as drying of ponds and wetlands, and also by multiple stresses (e.g., land-use changes, hunting regulations). • Methane hydrates: significant amounts of methane hydrates are contained in sediments, especially on Arctic continental shelves. As these areas warm, this methane may be released, adding to the greenhouse gas concentration in the atmosphere (Sloan, 2003; Maslin, 2004). • Southern Ocean carbon flux: climate models indicate that stratification of the Southern Ocean will change. This could change the community structure of primary producers and alter rates of draw-down of atmospheric CO2 and its transport to the deep ocean. The areally averaged warming in the Arctic is projected to range from about 2°C to about 9°C by the year 2100, depending on the model and forcing scenario. The projected warming is largest in the northern autumn and winter, and is largest over the polar oceans in areas of sea-ice loss. Over land, the projected warming shows less seasonal variation, although regions such as the Canadian Archipelago are not well resolved. In contrast to the unanimity of the models in predicting a north-polar amplification of warming, there are differences among the model projections concerning polar amplification in Antarctica, especially over the continent (Parkinson, 2004). However, in several simulations, the warming is amplified over a narrow Southern Ocean band from which sea ice retreats. (Kattsov et al., 2007). In addition, the partitioning among snow and rain will change in a warmer climate, affecting surface hydrology, terrestrial ecosystems and snow loads on structures. The ratio of rain to snow should increase especially in those seasons and Arctic sub-regions in which present-day air temperatures are close to freezing. The difference between precipitation and evapotranspiration (P-E), which over multi-year timescales is approximately equivalent to runoff (river discharge), is also projected to increase over the course of the 21st century. The projected increases of runoff by 2080 are generally in the range of 10 to 30%, largest in the A2 scenario and smallest in the B1 scenario. Of the major river basins, the largest increases are projected for the Lena River basin. Additional information on projected changes is presented elsewhere (Meehl et al., 2007). The effects of these freshwater changes on the thermohaline circulation are uncertain. A new study (Zhang and Walsh, 2006) based on the IPCC AR4 model simulations, projected mean reductions of annually averaged sea ice area in the Arctic by 2080-2100 of 31%, 33% and 22% under the A2, A1B and B1 scenarios, respectively (see Figure 15.3). A consistent model result is that the sea-ice loss is greater in summer than in winter, so that the area of seasonal (winter-only) sea-ice coverage actually increases in many models. The loss of summer sea ice will change the moisture supply to northern coastal regions and will be likely to impact the calving rates of glaciers that are now surrounded by sea ice for much of the year. There will also be increases in wind-driven transport and mixing of ocean waters in regions of sea-ice loss. The projected increases of Arctic river discharge and precipitation over polar oceans, as well as the projections of increasing discharge from the Greenland ice sheet (Lemke et al., 2007), point to a freshening of the ocean surface in northern high latitudes. However, the projected changes of ice discharge (calving rates) are generally not available from the model simulations, since the ice sheet discharge is not explicitly included in coupled global models. also implies a continuation of recent trends toward later freeze-up and earlier break-up of river and lake ice (Walsh et al., 2005). Projections of change agree that the retreat of glaciers will continue across Arctic glaciers, with a consequent impact on global sea level (Meehl et al., 2007). Recent changes in the Greenland ice sheet have, however, been complex. The colder interior has thickened, most probably as a result of recently high precipitation rates, while the coastal zone has been thinning. Thus some studies suggest that overall the ice sheet is growing in thickness (Krabill et al., 2000; Johannessen et al., 2005). However, there is a growing body of evidence for accelerating coastal thinning, a response to recent increases in summer melt (Abdalati and Steffen, 2001), and acceleration of many coastal glaciers (Krabill et al., 2004; Howat et al., 2005; Ekstrom et al., 2006; Luckman et al., 2006; Rignot and Kanagaratnam, 2006) suggest that thinning is now dominating the mass balance of the entire ice sheet. Warming, thawing and decrease in areal extent of terrain underlain by permafrost are expected in response to climatic change in the 21st century (Sazonova et al., 2004; Euskirchen et al., 2006; Lemke et al., 2007). Results from models forced with a range of IPCC climate scenarios indicate that by the mid-21st century the permafrost area in the Northern Hemisphere is likely to decrease by 20 to 35%, largely due to the thawing of permafrost in the southern portions of the sporadic and discontinuous zones, but also due to increasing patchiness in areas that currently have continuous permafrost (Anisimov and Belolutskaia, 2004). Projected changes in the depth of seasonal thawing (base of the active layer) are uniform neither in space nor in time. In the next three decades, active layer depths are likely to be within 10 to 15% of their present values over most of the permafrost area; by the middle of the century, the depth of seasonal thawing may increase on average by 15 to 25%, and by 50% and more in the northernmost locations; and by 2080, it is likely to increase by 30 to 50% and more over all permafrost areas (Anisimov and Belolutskaia, 2004; Instanes et al., 2005). Current and projected changes in the Antarctic ice sheet are discussed in greater detail elsewhere (Lemke et al., 2007), and are only summarised here. Recent changes in volume of the Antarctic ice sheet are much better mapped and understood than they were in the TAR, but competing theories over the causes still limits confidence in prediction of the future changes. The ice sheet on the Antarctic Peninsula is probably alone in showing a clear response to contemporary climate change (see Section 15.6.3), while the larger West Antarctic and East Antarctic ice sheets are showing changes whose attribution to climate change are not clear, but cannot be ruled out. In West Antarctica, there is a suggestion that the dramatic recent thinning of the ice sheet throughout the Amundsen Sea sector is the result of recent ocean change (Payne et al., 2004; Shepherd et al., 2004), but as yet there are too few oceanographic measurements to confirm this interpretation. Indeed, there is evidence that deglaciation of some parts of West Antarctica, as a response to climate change at the end of the last glacial period, is not yet complete (Stone et al., 2003). There are still competing theories, but the now clear evidence of ice-sheet change, has reinvigorated debate about whether we should expect a deglaciation of part of the West Antarctic ice sheet on century to millennial timescales (Vaughan, 2007). Studies based on satellite observations do not provide unequivocal evidence concerning the mass balance of the East Antarctic ice sheet; some appear to indicate marginal thickening (Davis et al., 2005), while others indicate little change (Zwally et al., 2005; Velicogna and Wahr, 2006; Wingham et al., 2006). Permafrost in ice-free areas, seasonal snow cover, and lakeice do exist in Antarctica but in such small areas that they are only discussed in respect to particular impacts. Some freshwater systems exist wholly within the Arctic but many others are fed by river and lake systems further south. The latter includes five of the world's largest river catchments, which act as major conduits transporting water, heat, sediment, nutrients, contaminants and biota into the Arctic. For these systems, it will be the basin-wide changes that will determine the Arctic impacts. Historically, the largest changes to northern river systems have been produced by flow regulation, much of it occurring in the headwaters of Arctic rivers. For Canada and Russia, it is these northward-flowing rivers that hold the greatest remaining potential for large-scale hydroelectric development (e.g., Shiklomanov et al., 2000; Prowse et al., 2004). Similar to some expected effects of climate change, the typical effect of hydroelectric flow regulation is to increase winter flow but also to decrease summer flow and thereby change overall inter-seasonal variability. In the case of the largest Arctic-flowing river in North America, the Mackenzie River, separating the effects of climate change from regulation has proven difficult because of the additional dampening effects on flow produced by natural storage-release effects of major lake systems (e.g., Gibson et al., 2006; Peters et al., 2006). For some major Russian rivers (Ob and Yenisei), seasonal effects of hydroelectric regulation have been noted as being primarily responsible for observed trends in winter discharge that were previously thought to be a result of climatic effects (Yang et al., 2004a, b). By contrast, winter flow increases on the Lena River have resulted primarily from increased winter precipitation and warming (Yang et al., 2002; Berezovskaya et al., 2005). Spatial patterns in timing of flows, however, have not been consistent, with adjacent major Siberian rivers showing both earlier (Lena -Yang et al., 2002) and later (Yenisei - Yang et al., 2004b) spring flows over the last 60 years. Although precipitation changes are often suspected of causing many changes in river runoff, a sparse precipitation monitoring network in the Arctic, makes such linkages very difficult (Walsh et al., 2005). Seasonal precipitation-runoff responses could be further obscured by the effects of permafrost thaw and related alterations to flow pathways and transfer times (Serreze et al., 2003; Berezovskaya et al., 2005; Zhang et al., 2005). Over the last half-century, the combined flow from the six largest Eurasian rivers has increased by approximately 7% or an average of 2 km3/yr (Peterson et al., 2002). The precise controlling factors remain to be identified, but effects of ice-melt from permafrost, forest fires and dam storage have been eliminated as being responsible (McClelland et al., 2004). Increased runoff to the Arctic Ocean from circumpolar glaciers, ice caps and ice sheets has also been noted to have occurred in the late 20th century and to be comparable to the increase in combined river inflow from the largest pan-Arctic rivers (Dyurgerov and Carter, 2004). The Arctic contains numerous types of lentic (still-water) systems, ranging from shallow tundra ponds to large lakes. Seasonal shifts in flow, ice cover, precipitation/evapotranspiration and inputs of sediment and nutrients have all been identified as climate-related factors controlling their biodiversity, storage regime and carbon-methane source-sink status (Wrona et al., 2005). A significant number of palaeolimnological records from lakes in the circumpolar Arctic have shown synchronous changes in biological community composition and sedimentological parameters associated with climate-driven regime shifts in increasing mean annual and summer temperatures and corresponding changes in thermal stratification/stability and ice-cover duration (e.g., Korhola et al., 2002; Ruhland et al., 2003; Pienitz et al., 2004; Smol et al., 2005; Prowse et al., 2006b). Figure 15.4. Locations of Siberian lakes that have disappeared after a three-decade period of rising soil and air temperatures (changes registered from satellite imagery from early 1970s to 1997-2004), overlaid on various permafrost types. The spatial pattern of lake disappearance suggests that permafrost thawing has driven the observed losses. From Smith et al., 2005. Repnnted with permission from AAAS. disappearance strongly suggests that permafrost thawing is driving the changes. Changes in Arctic freshwater systems will have numerous impacts on the physical regime of the Arctic, particularly affecting hydrological extremes, global feedbacks and contaminant pathways. Hydrological models based on atmosphere-ocean general circulation models (AOGCMs) have consistently also predicted increases in flow for the major Arctic river systems, with the largest increases during the cold season (Miller and Russell, 2000; Arora and Boer, 2001; Mokhov et al., 2003; Georgievsky et al., 2005). Less clear is what may occur during the summer months, with some results suggesting that flow may actually decrease because of evaporation exceeding precipitation (e.g., Walsh et al., 2005). Reductions in summer flow could be enhanced for many watersheds because of increases in evapotranspiration as dominant terrestrial vegetation shifts from non-transpiring tundra lichens to various woody species (e.g., Callaghan et al., 2005). CO2-induced reductions in transpiration might offset this, and have been suggested as being responsible for some 20th-century changes in global runoff (Gedney et al., 2006). Since Arctic river flow is the major component of the freshwater budget of the Arctic Ocean (Lewis et al., 2000), it is important to the supply of freshwater to the North Atlantic and related effects on the thermohaline circulation (Bindoff et al., 2007). The sum of various freshwater inputs to the Arctic Ocean has matched the amount and rate at which freshwater has accumulated in the North Atlantic over the period 1965 to 1995 (Peterson et al., 2006). Under greenhouse gas scenarios, the total annual river inflow to the Arctic Ocean is expected to increase by approximately 10 to 30% by the late 21st century (Walsh et al., 2005). An additional source of future freshwater input will be from melting of large glaciers and ice caps, most notably from Greenland (Gregory et al., 2004; Dowdeswell, 2006). The cumulative effect of these increasing freshwater supplies on thermohaline circulation remains unclear but is a critical area of concern (Loeng et al., 2005; Bindoff et al., 2007). Warming is also forecast to cause reductions in river- and lake-ice cover, which will lead to changes in lake thermal structures, quality/quantity of under-ice habitat and effects on ice jamming and related flooding (Prowse et al., 2006a). Specific to the latter, forecasts of earlier snowmelt freshets could create conditions more conducive to severe break-up events (Prowse and Beltaos, 2002), although a longer period of warming could also reduce severity (Smith, 2000). This effect, however, is likely to be offset on some large northward-flowing rivers because of reduced regional contrasts in south-to-north temperatures and related hydrological and physical gradients (Prowse et al., 2006a). Projected changes of permafrost, vegetation and river-runoff may have noticeable impacts on river morphology, acting through destabilisation of banks and slopes, increased erosion and sediment supply, and ultimately leading to the transformation between multi- and single-channel types. Geological reconstructions and numerical simulations indicate that such transformations and also erosion events and flood risks occur especially at times of permafrost degradation (Bogaart and van Balen, 2000; Vandenberghe, 2002). Such changes are largely controlled by thresholds in sediment supply to the river and discharge (Vandenberghe, 2001). However, historical examples have shown that variability in flow regime is less important than variability in sediment supply, which is especially determined by the vegetation cover (Huisink et al., 2002; Vandenberghe and Huisink, 2003). Thus an increasingly denser vegetation cover may counter increased sediment discharge, which has been modelled to rise in Arctic rivers with both increases in air temperature and water discharge (Syvitski, 2002). Various changes in Arctic hydrology have the potential to effect large changes in the proportion of pollutants (e.g., persistent organic pollutants and mercury) that enter Arctic aquatic systems, either by solvent-switching or solvent-depleting processes (e.g., MacDonald et al., 2003). Given that the Arctic is predicted to be generally 'wetter', the increase in loadings of particulates and contaminants that partition strongly into water might more than offset the reductions expected to accrue from reductions in global emissions (e.g., MacDonald et al., 2003). Shifts in other hydrological regime components such as vegetation, runoff patterns and thermokarst drainage (Hinzman et al., 2005) all have the capacity to increase contaminant capture. Changes in aquatic trophic structure and related rate functions (see Section 15.4.1.3) have further potential to alter the accumulation of bio-magnifying chemicals within food webs. Projected changes in runoff, river- and lake-ice regimes, and seasonal and interannual water balance and thermal characteristics will alter biodiversity and productivity relationships in aquatic ecosystems (Walsh et al., 2005; Prowse et al., 2006b; Wrona et al., 2006a). Ultimately the dispersal and geographical distribution patterns of aquatic species will be altered, particularly for fish (Reist et al., 2006a). Extension of the ice-free season may lead to a decline in fish habitat availability and suitability, particularly affecting species such as lake trout (Salvelinus namaycush) that prefer colder waters (Hobbie et al., 1999; Reist et al., 2006b). The projected enhanced river flows will also increase sediment transport and nutrient loading into the Arctic Ocean, thereby affecting estuarine and marine productivity (Carmack and Macdonald, 2002). 2005; Flanagan et al., 2006). Initial permafrost thaw will form depressions for new wetlands and ponds interconnected by new drainage networks. This will allow for the dispersal and establishment of new aquatic communities in areas formerly dominated by terrestrial species (Wrona et al., 2006b). As the permafrost thaws further, surface waters will increasingly drain into groundwater systems, leading to losses in freshwater habitat. Southerly species presently limited by temperature/ productivity constraints will probably colonise Arctic areas, resulting in new assemblages. Many of these, particularly fishes, will be likely to out-compete or prey upon established Arctic species, resulting in negative local effects on these (Reist et al., 2006a). These southern emigrants to the Arctic will also bring with them new parasites and/or diseases to which Arctic species are not adapted, thereby increasing mortality (Wrona et al., 2006b). Direct environmental change combined with indirect ecosystem shifts will significantly impact local faunas by reducing productivity, abundance and biodiversity. Such effects will be most severe for freshwater fish that rely entirely upon local aquatic ecosystems (Reist et al., 2006c). Distributions of anadromous fish, which migrate up rivers from the sea to breed in freshwater, will probably shift as oceanic conditions and freshwater drainage patterns are affected (Reist et al., 2006c); as will the geographical patterns of habitat use of migratory aquatic birds and mammals (Wrona et al., 2005). Important northern fish species such as broad whitefish (Coregonus nasus), Arctic char (Salvelinus alpinus), inconnu (Stenodus leucichthys), Arctic grayling (Thymallus arcticus) and Arctic cisco (Coregonus autumnalis) will probably experience population reductions and extirpations (e.g., due to reproductive failures), contraction of geographical ranges in response to habitat impacts, and competition and predation from colonising species (Reist etal., 2006a, b,c). Given the large hydrological changes expected for Arctic rivers, particularly regarding the magnitude of the spring freshet, climate-induced changes must be factored into the design, maintenance and safety of existing and future development structures (e.g., oil and gas drilling platforms, pipelines, mine tailings ponds, dams and impoundments for hydroelectric production) (World Commission on Dams, 2000; Prowse et al., 2004; Instanes et al., 2005). water contamination could affect groundwater reserves (Warren et al., 2005). Northern freshwater ecosystems provide many services to Arctic peoples, particularly in the form of harvestable biota used to support both subsistence and commercial economies (Reist et al., 2006b). Shifts in ecosystem structure and function will result in substantial changes in the abundance, replenishment, availability and accessibility of such resources which, in turn, will alter local resource use and traditional and subsistence lifestyles (Nuttall et al., 2005; Reist et al., 2006b). It is unlikely that such changes related to natural freshwater systems would be offset by increased opportunity for freshwater aquaculture resulting from a warming climate. Thus, conservation of Arctic aquatic biodiversity, maintenance of traditional and subsistence lifestyles, and continued viability and sustainable use of Arctic freshwater resources will present significant challenges for Arctic peoples, resource managers and policy-makers (Wrona et al., 2005; Reist et al., 2006b). Climatic changes during the past 20,000 years and more have shaped current biodiversity, ecosystem extent, structure and function. Arctic species diversity is currently low, partly because of past extinction events (FAUNMAP Working Group, 1996). As a group, large mammals are in general more vulnerable to current change than in the past when the group contained many more species. Also, tundra ecosystem extent, particularly in Eurasia, is now less than during the glacial period, when extensive tundra-steppe ecosystems existed (Callaghan et al., 2005). Modern habitat fragmentation (e.g., Nellemann et al., 2001), stratospheric ozone depletion, and spread of contaminants, compound the ongoing impacts of anthropogenic climate change and natural variability on ecosystems and their services. Traditional ecological knowledge (TEK, see Section 15.6.1) from Canada has recorded current ecosystem changes such as poor vegetation growth in eastern regions associated with warmer and drier summers; increased plant biomass and growth in western regions associated with warmer, wetter and longer summers; the spreading of some existing species, and new sightings of a few southern species; and changing grazing behaviours of musk oxen and caribou as the availability of forage increases in some areas (Riedlinger and Berkes, 2001; Thorpe et al., 2001; Krupnik and Jolly, 2002). Arctic waders, have declined substantially (Stroud et al., 2004) due to various causes including climate change and loss of habitat on migration routes and wintering grounds (Morrison et al., 2001,2004; Zockler, 2005). In contrast, populations of Arctic breeding geese, which in winter increasingly feed on agricultural crops or unharvested grain, have shown a geometric increase in numbers in Europe and North America, which has led to intense foraging in Arctic coastal breeding habitats, loss of vegetation and the occurrence of hypersaline soils (Jefferies et al., 2006). Although there are examples from temperate latitudes, evidence for early arrival of migratory birds in the Arctic is weak (Gauthier et al., 2005), emphasising the need for adequate monitoring programmes (Both et al., 2005). Some populations of caribou/reindeer, which are essential to the culture and subsistence of several Arctic peoples, are currently in decline (Russell et al., 2002; Chapin et al., 2005a), mainly due to social and cultural factors. However, climate impacts have also affected some populations. 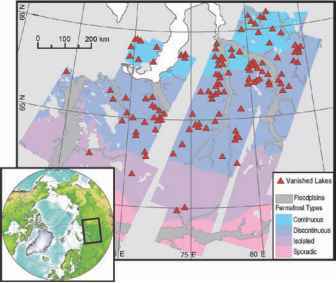 Icing events during warmer winters that restrict access to frozen vegetation have impacted some reindeer/caribou populations and high-Arctic musk oxen populations (Forchhammer and Boertmann, 1993; Aanes et al., 2000; Callaghan et al., 2005 and references therein). Evidence of recent vegetation change is compelling. Aerial photographs show increased shrub abundance in Alaska in 70% of 200 locations (Sturm et al., 2001; Tape et al., 2006). Along the Arctic to sub-Arctic boundary, the tree line has moved about 10 km northwards, and 2% of Alaskan tundra on the Seward Peninsula has been displaced by forest in the past 50 years (Lloyd et al., 2003). In some areas, the altitude of the tree line has risen, for example by about 60 m in the 20th century in subArctic Sweden (Callaghan et al., 2004; Truong et al., 2007), although the tree line has been stable or become lower in other localities (Dalen and Hofgaard, 2005). Bog growth has caused tree death in parts of the Russian European Arctic (Crawford et al., 2003). The pattern of northward and upward tree-line advances is comparable with earlier Holocene changes (MacDonald et al., 2000; Esper and Schweingruber, 2004) (see below for rates of advance). In addition to changes in woody vegetation, dry-habitat vegetation in sub-Arctic Sweden has been partly displaced by wet-habitat vegetation because of permafrost degradation in the discontinuous permafrost zone (Christensen et al., 2004; Malmer et al., 2005). Similarly, in northern Canada, up to 50% of peat plateau permafrost has thawed at four sites in the discontinuous permafrost zone (Beilman and Robinson, 2003). There is also recent evidence of changes in growing season duration and timing, together with plant productivity, but patterns are spatially variable. Analyses of satellite images indicate that the length of growing season is increasing by 3 days per decade in Alaska and 1 day per decade in northern Eurasia (McDonald et al., 2004; Smith et al., 2004; McGuire et al., 2007), but there has been a delayed onset of the growing season in the Kola Peninsula during climatic cooling over the past two decades (H0gda et al., 2007). Remote sensing estimates of primary productivity also show spatial variability: there were increases in the southern Arctic and decreases in the central and eastern Russian Arctic between 1982 and 1999 (Nemani et al., 2003).